Make Israel Great Again Also. As of this writing, FiveThirtyEight’s forecasting model gives Donald Trump a 30 percent chance of winning the presidency this November. That’s roughly as good a shot as Nate Silver’s algorithms gave Mitt Romney back in 2012. And yet, Trump’s White House hopes are being written off by pundits — and down-ballot Republicans — to a degree that Romney’s never were. There are a lot of reasons why this year’s race feels less close than that of four years ago. Some may be purely subjective. For example, the fact that so few GOP elites loudly defend Trump may exaggerate perceptions of how badly he’s losing. But there are also empirical reasons for taking a dimmer view of Trump’s prospects — including the fact that the GOP nominee has one campaign office in Florida right now. The trouble with most 2016 forecasting models is that they don’t take into account the relative organizational strength of each campaign. Put more plainly, they don’t weigh the likely effects of the Trump campaign being a garbage fire. Which seems like a significant deficiency. Campaigns invest in turnout operations because winning the “ground game” can help outperform their polls by a couple points. In a close race, that edge can dramatically increase a campaign’s probability of victory. That’s why, by June 2012, Mitt Romney had two dozen campaign offices in the Sunshine State — and why Hillary Clinton has 51 such offices there today. By that point, Trump 2016 will likely have more field offices in the occupied West Bank than it does in Florida. 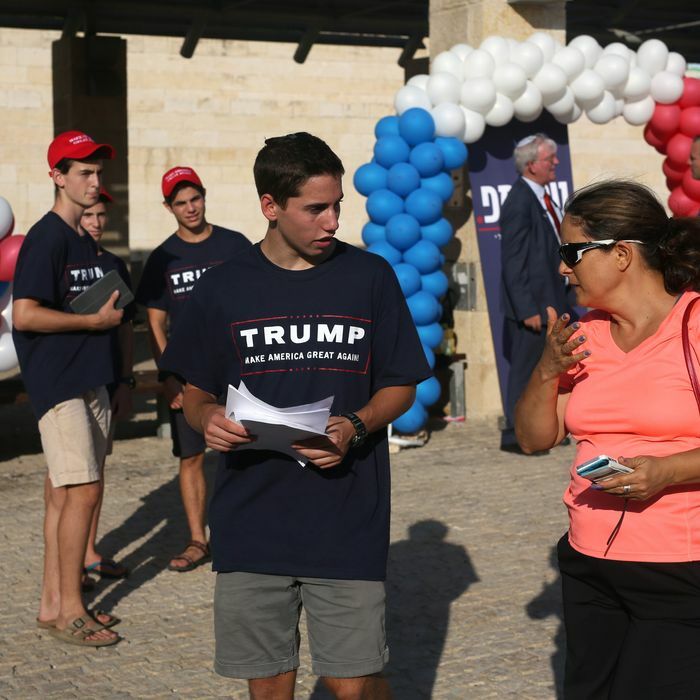 According to the Jewish Daily Forward, the Trump campaign will open two offices in Israeli settlements after Labor Day, one in all-important Karnei Shomron county, the other in the key swing district of Gush Etzion. The campaign hopes to maximize turnout among the 15 percent of Jewish settlers that have American citizenship. Which is fine. American-Israelis vote overwhelmingly Republican, so, all else being equal, high turnout among that demographic should benefit Trump. But as far as voting blocs go, this one is fairly small — and likely concentrated in many thoroughly uncompetitive states (a lot of American Jews hail from New York and California). So, a competent campaign would focus more energy on turning out non-college-educated whites in the Florida Panhandle, and less on energizing voters in Israel, Washington state, and Mississippi.